We’re taught from a young age to not talk to strangers, a lesson that’s been reinforced by the Taken franchise and most episodes of CSI. But Amar Bakshi, founder of the multidisciplinary collective Shared Studios, has come up with an exception to that rule. Bakshi is the creator of Portals, a global art project that could be described as the 21st century’s answer to a pen pal. 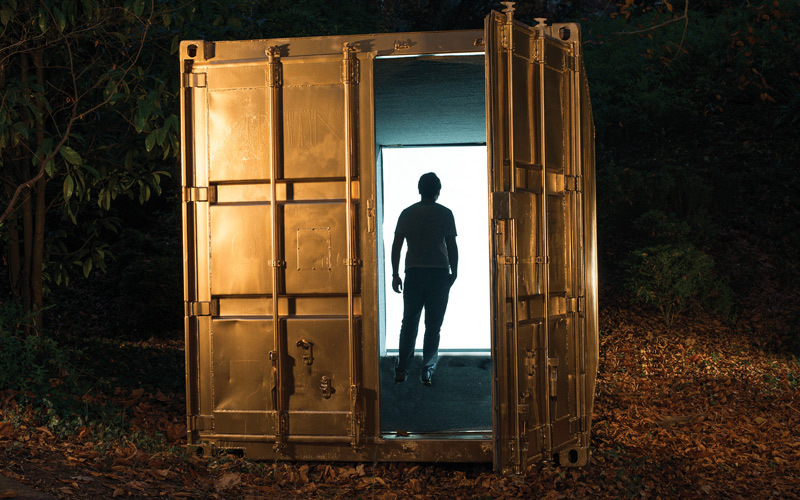 The idea is to provide a space—in this case a gold-painted shipping container outfitted with a giant video screen—where two strangers can have a face-to-face conversation despite being half a world apart. One such portal is stationed in Grand Park from April 10 through 23. When a user steps inside, he or she is met with a full-body image of someone in a sister portal who is ready and willing to shoot the breeze. One-on-one hang sessions (sometimes aided by text translations) are most common, but portals serve more pointed purposes, too. They’ve been used to orchestrate family reunions, and recently a group of drummers in Mumbai collaborated with percussionists in Chicago. Bakshi dreamed up Portals in 2014 after traveling the world as a roving reporter for The Washington Post in 2007. “When you’re on a bus in the Philippines or India with nothing to do but talk to a stranger for eight hours, you go very deep,” he says. “Portals is about getting lost in the world with one another.” Bakshi and his team have placed their containers everywhere: in defunct airports (Berlin), on college campuses (Herat, Afghanistan), at refugee camps (Arbil, Iraq), and in museums (Washington, D.C.).